We've caught tulip fever and are swooning over this pretty dress. It's a classy maxi with a ladylike silhouette, casual yet appropriate for so many occasions. This dress is lovely. No wrinkles at all when I took it out of the package. Fit was perfect for me. Wore it Easter Sunday to church. The petite length was just right for me at 52. I recommend. Cute summer dress. I ordered my usual size, and used the size guide and it fit perfectly. I love the dress but had to exchange for the next size up because it has a straight skirt and I am more pear shaped. The fabric should be cool in the summer-light weight . Love the wrap style. No issues with gaping. I have not worn this as of yet. I just received it. I am a little "hippie" so I ordered a size up (as some recommended). However, that leaves the top a bit more ample. At first glance, this seems like a nice dress for the price. I am going to try to pair it with a jacket. I like that the gray can be dressed up or down. We shall see how it holds up. 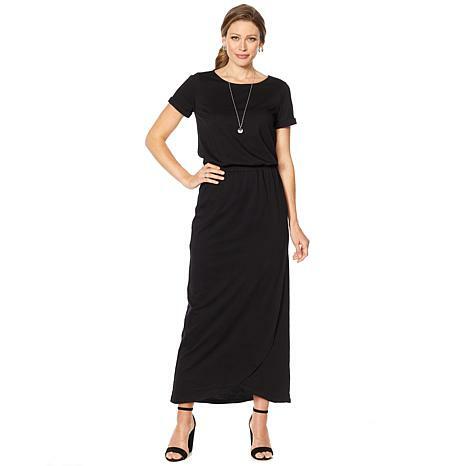 It is hard to find a maxi dress with small sleeves and one that could be adapted to the work place too. I hope it works out for me. 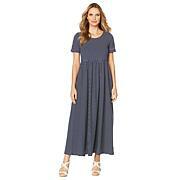 I ordered 2 of these really cute dresses, one in the teal the other Grey. I ordered a large cause my top is way bigger then my bottom. Well the top part fit great but the hip and below area was just way to large. This is not a problem with the dress, just my body. I really loved both of them. The fabric is a nice weight and the teal color is so pretty and perfect for Spring. Well unfortunately I had to send them back but ordered another dress with a little flare to it and it fit perfect. Curations Boho Chiffon Midi Dress with Slip An instant must-have. This midi dress conjures up warm breezes, beach day vibes and all your festival planning this season. And with so many options to style it, you'll find yourself reaching in your closet for it again and again.